SST 1 serves 13 counties in northwest Ohio. SST 2 serves the counties of Erie, Lorain and Huron. SST 3 serves Cuyahoga County. SST 4 serves the counties of Lake and Geauga. SST 5 serves the counties of Ashtabula, Mahoning, Trumbull and Columbiana. SST 6 serves the counties of Auglaize, Champaigne, Hardin, Logan, Mercer and Shelby. SST 7 serves the counties of Ashland, Crawford, Huron, Knox, Marion, Morrow, Richland, Seneca and Wyandot. SST 8 serves the counties of Medina, Summit and Portage. SST 9 serves the counties of Holmes, Stark and Wayne. SST 10 serves the counties of Clark, Darke, Greene, Miami, Montgomery and Preble. SST 11 serves the counties of Delaware, Fairfield, Franklin, Licking, Madison, Pickaway, Union and Chillicothe City Schools located in Ross County. SST 12 serves the counties of Guernsey, Muskingum, Belmont, Perry, Monroe, Morgan, Holmes, Coshocton, Harrison, Jefferson, Noble, Tuscarawas and Carroll. SST 13 serves the counties of Butler, Clermont, Hamilton and Warren. SST 14 serves the counties of Adams, Brown, Clinton, Fayette and Highland. 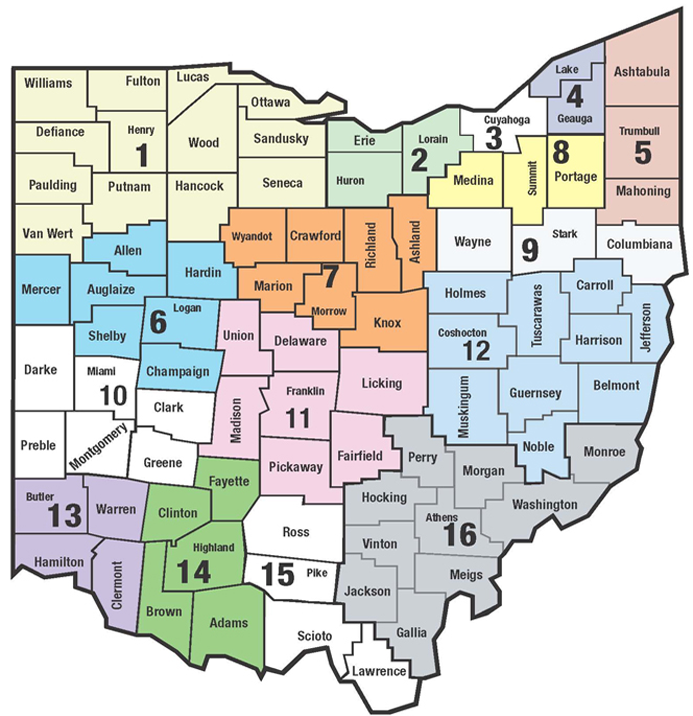 SST 15 serves the counties of Ross, Pike, Scioto and Lawrence. SST 16 serves the counties of Athens, Gallia, Hocking, Jackson, Meigs, Perry, Vinton and Washington.